Palestrina, Hans Pfitzner's masterpiece, is held in high regard in German-speaking countries, but only rarely performed in the rest of the world. It didn't receive a professional premiere in the UK until 1997 at Covent Garden. 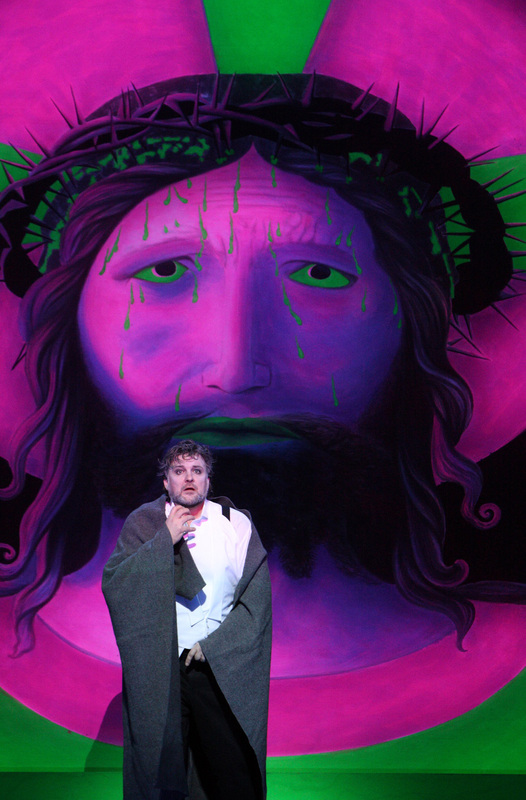 The production subsequently travelled to the Metropolitan Opera in New York, where it received mixed reviews. There are a number of reasons for its checkered performance history. Composed in 1917, Pfitzner's musical idiom is considered old fashioned for its time - he bucked the trend when all his contemporaries were moving away from tonal compositions towards serialism. The score is stylistically closer to Wagner and Strauss than Schoenberg and Webern. Also there is the not-so-minor issue of Pftizner's Nazi leanings. There exists plenty of documented evidence of his racist and anti-Semitic views, and it's inevitable that Pfitzner the composer and Pfitzner the man are often conflated in any discussion. Even within Germany, a musically worthy opera like Palestrina received scant attention - until now, that is. There appears to be a mini-renaissance at the moment. 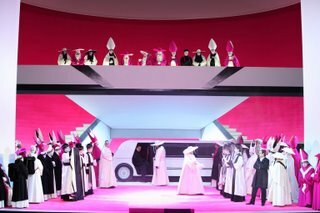 Frankfurt Opera is offering a Harry Kupfer production of Palestrina with Kirill Petrenko in the pit, slated for June-July 2010. Munich is bringing back its production in spring 2010 with major changes, chiefly Charles Workman replacing Christopher Ventris in the title role, and Asher Fisch taking over from Simone Young. And finally, Chemnitz Opera staged the composer's Die Rose vom Liebesgarten starring its house prima donna Astrid Weber this past season. Perhaps one of the biggest obstacles to greater popularity of Palestrina is its musical complexity and its inordinate length - with two intermissions, it typically runs in excess of five hours. It takes a house with deep pockets like the Bavarian State Opera to do it justice, and it is fitting that a revival of this work takes place in Munich, as it began life in the Prinzregententheater in Munich in 1917, with Karl Erb in the title role and conducted by Bruno Walter. 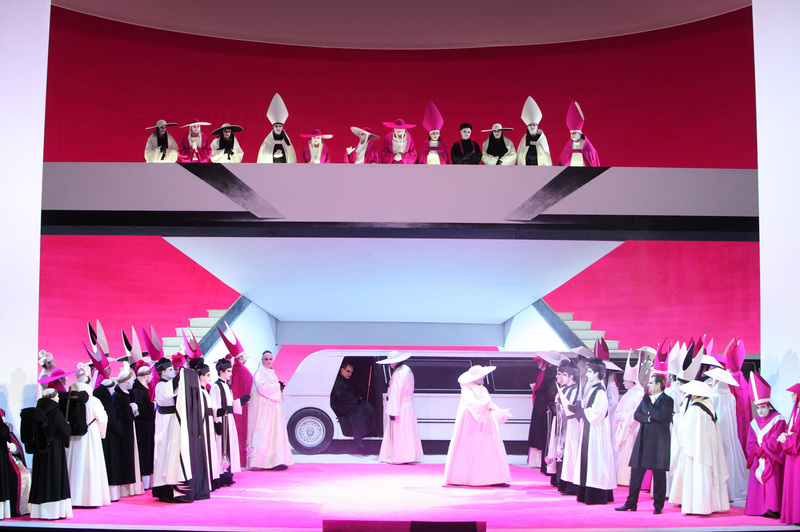 The opera tells the story of Giovanni Pierluigi Palestrina writing the Missa Papae Marcelli in the 16th century, a time when the church was trying to ban polyphony and return to Gregorian chant. His writing of this mass prevented the regression of church music. The current production, first seen last January, is by director Christian Stuckl, who has done a superb job in coming up with a modern, stylized production that pulls no punches in its condemnation of the Catholic Church. The use of vibrant colours, the various updating - including Giovanni Morone (Michael Volle) arriving in a white stretch limo! - and most of all his ability to inject action into an essentially static opera all make it much more accessible than it would have been. Despite his best efforts however, there is no escaping the fact that there is simply too much text in the opera. Act One moves at glacial pace. In about one hour forty-five minutes, the only thing that happens is Palestrina - sung magnificently (July 10) by British tenor Christopher Ventris - sitting at his desk trying to compose but suffering from writer's block. He is interrupted by the arrival of Borromeo (Falk Struckmann), and the two men carry on a very lengthy dialogue. Without English translations, it's hard sledding for non-German speakers, no matter how well prepared one is beforehand. The appearance of angels in the last fifteen minutes relieved the tedium somewhat. Act Two is set in the Great Hall in Cardinal Madruscht's Palace in Trent, where a convention is taking place. Stuckl livens up this ninety minutes with a colourful display of papal-wear. Each character is finely drawn, and expertly acted by the large ensemble cast. They all wear black makeup around the eyes and mouth, creating an air of grotesquerie. As incongruous as it may seem, there are actually moments of slapstick involving Bishop of Budoja (tenor Ulrich Ress) and other characters, particularly the highly unlikable Bernardo Novagerio, played and sung brilliantly by tenor John Daszak. Act Two ends in a brutal massacre, and an all-out brawl reminiscent of the end of Act Two Die Meistersinger. After the two lengthy acts, Act Three at forty minutes is refreshingly brief. It is also here that Pfitzner is at his most musically inspired. Palestrina, now aged and weak, faces imprisonment by Borromeo. He is saved by his student Ighino (soprano Christiane Karg in a luminous performance) who hands over the music of the Mass. The work is then performed and is well received. The populace can be heard offstage singing the praise of Palestrina. Pop Pius IV appears and invites Palestrina to lead the Sistine Choir. There are moments of great beauty in the score here that rivals Act Three Parsifal. Palestrina dies amidst cries of "Evviva Palestrina!" Seen on July 10, I find Ventris supremely moving and heart-felt throughout, but particularly in Act Three. When Ighino makes a garland from branches and puts it on Palestrina, the echos of Act Three Meistersinger is unmistakable. However, the star of the evening was the orchestra under Simone Young, who coaxed fabulous sounds from the Munich forces. The singers and conductor were rewarded with enthusiastic ovations at the end. But it must be said that the intensity of the ovations in no way matched the other evenings at the opera. It seems that even for Germans, five hours of theological debate is too much - I noticed more empty seats with each passing intermission. I also noticed that there were six cameras in the auditorium, so we can expect a DVD release sometime in the near future. I look forward to experiencing it again, this time with subtitles!